© 2001, © 2018 by Paul Freeman. Revised 6/17/18. A 1/20/65 aerial view of Kaanapali Airport (from the University of HI). This small airport was located along the west coast of the Island of Maui. nor on the November 1960 Hawaiian Islands Sectional Chart. to transport workers & materials into West Maui’s new resort developed by Amfac Inc. Surrounded by sugar cane, Runway 01/19 started just 30 feet from the shoreline & extended north 2,615'. The earliest depiction which has been located of the Kaanapali Airport was a 1/20/65 aerial view (from the University of HI). 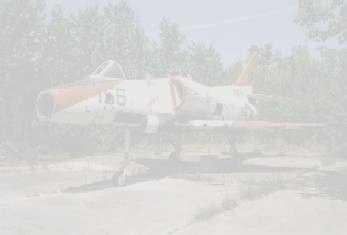 It depicted the field as having a single, narrow, northeast/southwest runway. Several light planes were parked on a ramp on the south side, near some small buildings. 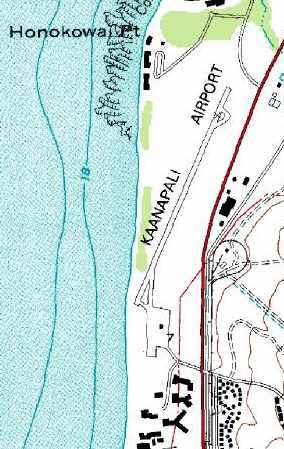 Kaanapali Airport, as depicted on the 1967 HI State Transportation Map (courtesy of Kevin Walsh). was on the December 1968 Hawaiian Islands Sectional Chart. It depicted Kaanapali as a private field with a 2,600' paved north/southrunway. Eddie Lopez recalled, “In the late 1960s I was a flight attendant with JetAire Hawaii flying DeHavilland Twin Otters. Kaanapali was a regular stop on our way to Kona. #61 – 10-06-1967, #54 – 09-12-1967, #65 – 01-11-1968, #91 – 01-31-1968, #101 – 05-08-1968. The hairiest landings were at Kaanapali. 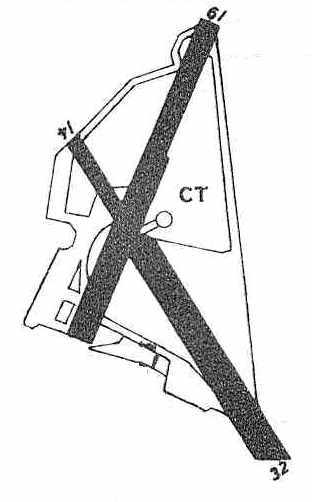 Many times we glided in with nose pointing North on a SW/NE runway. The Otters were Short Takeoff & Landing aircraft & when we had no passengers the pilots would perform STOL landings & take offs. Johnny Miller recalled, “My wife & I landed a rented Piper Cherokee on this airstrip in August 1970 while on our honeymoon. It was not shown on the chart I had with me at the time. we were not well received & were politely but firmly asked to leave. The airstrip was in good condition & was surrounded by sugar cane fields. An undated (circa 1970s?) postcard of a Twin Cessna & a Piper in front of Kaanapali's terminal building. An undated (circa 1970s?) 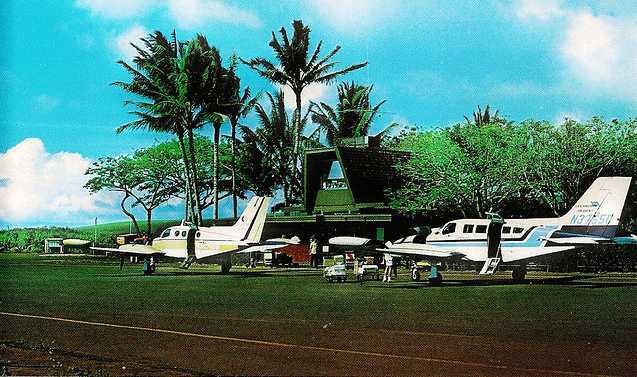 postcard of a Twin Commander in front of Kaanapali Airport's terminal building (courtesy of Kevin Walsh). A 1977 aerial view depicted Kaanapali Airport as having a single paved northeast/southwest runway. was on the December 1977 Hawaiian Islands Sectional Chart (courtesy of Chris Kennedy). It depicted Kaanapali as a private field with a single 2,600' paved runway. The remarks said "Restricted to previously approved commercial operations only." David Lien recalled that the Kaanapali Airport "was there in the late 1970s or early 1980s, used by Federal Express. and dropped off packages of documents for overnight delivery to the mainland via Honolulu. The airstrip itself seemed short & not in great shape, but Fedex used it. and it seems like it was a combination bar & 2 story control tower all made of old plywood. As I recall it looked like something out of an old WW2 tropics movie. It is my further recollection that this airport was about to be overrun by the heavy development at the time." initially using Cessna 402 aircraft. due to the challenge offered by its short length. and cut a narrow swath through high green cane fields. which also had a tiny lounge on the second floor known as the Windsock. "The wind line stood out as the most remarkable obstacle to a Kaanapali landing. which shielded much of the southwestern side of the island from trade winds. and, depending on wind direction that hour, windsocks could hang limp or dance along in 25 knot winds. Sometimes the ocean sock showed no wind & the mountain sock stuck straight out. You could even see the wind line drawn across the sea of sugar cane & blue ocean surface. When the line crossed the far end of the field, it presented no serious problems to landings. A wind line in the touchdown zone was a different animal entirely." and the Kaanapali airfield was in operation then & a car rental operation was there." described Kaanapali Airport as having a single 2,615' asphalt Runway 1/19. The remarks said, "Private. Closed to public. Airport is permanently closed to private aircraft." Bill Jacobs recalled, “In 1983 on my honeymoon we took a C402 over to Kaannapali Airport to see Maui. The whole way over this lady in front of us opened her newspaper to read, obstructing our view. We couldn’t believe she wouldn’t be in awe of the beautiful view out the windows. along with a paved ramp at the southern end, with a single building in the middle of the ramp. An undated aerial view looking northeast on final approach to Kaanapali's Runway 1. 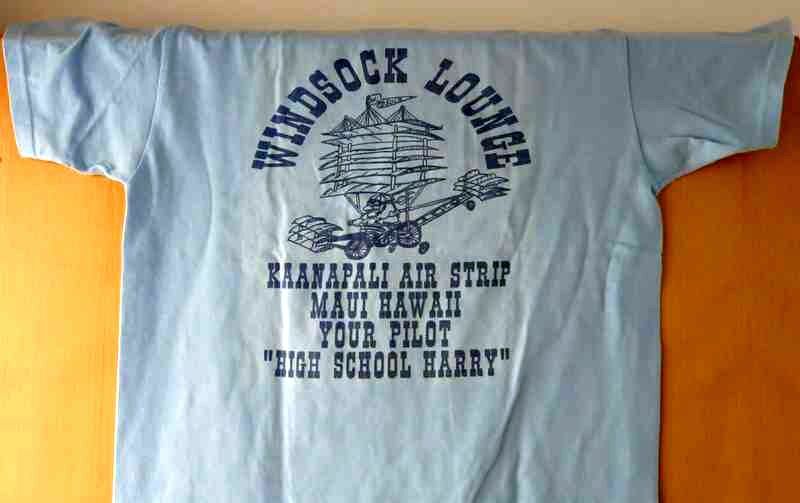 An undated T-shirt commemorating the “Windsock Lounge, Kaanapali Air Strip” (courtesy of Mike Kmetz). 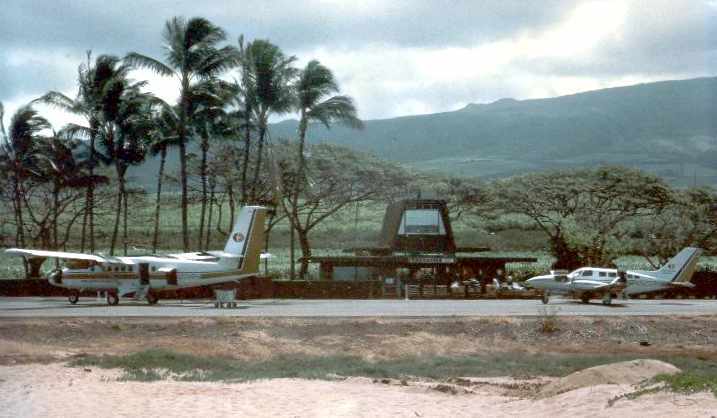 An October 1980 photo of 2 twin Cessnas at Kaanapali Airport. from a 1982 HI Visitors' Bureau brochure (courtesy of Kevin Walsh). Around 1983 Royal Hawaiian acquired 2 Twin Otters, which flew nearly exclusively on the Honolulu to Kaanapali route. and on particularly nasty days only the twin Cessnas landed at this beach strip. An undated (circa mid 1980s?) photo of a Royal Hawaiian Twin Otter & Cessna 402 in front of Kaanapali Airport's terminal building. 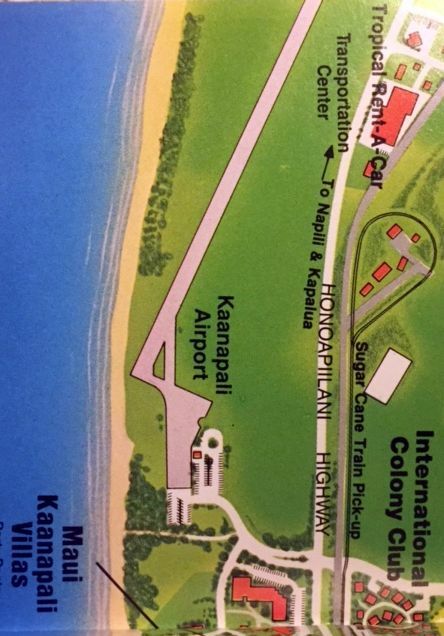 The last depiction which has been located of Kaanapali Airport was on a 1986 road map (courtesy of Kevin Walsh). 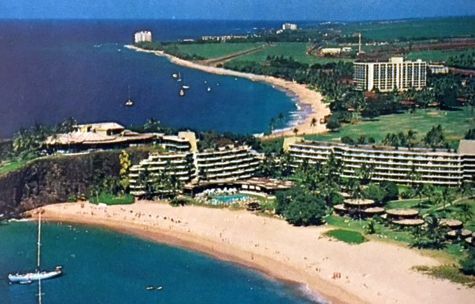 In 1986 Royal announced that Kaanapali Airport would close to make room for a hotel project. but if Kaanapali service were coming to an end, then they should be on the last plane out of town. For this reason Royal needed 4 extra 402s for the final Kaanapali to Honolulu flight that late afternoon. and in short time the airline ceased operations. 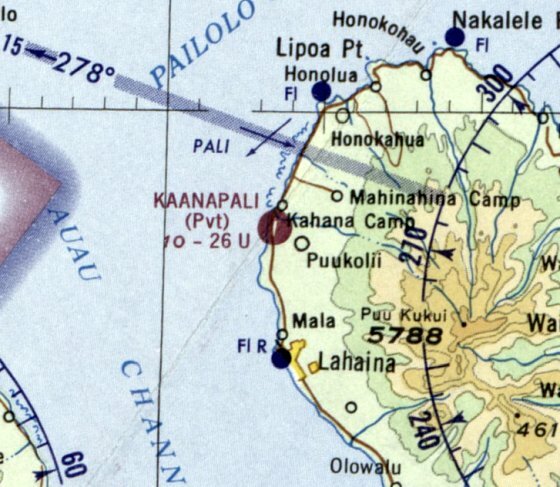 Kaanapali Airport was no longer depicted on the March 1993 Hawaiian Islands Sectional Chart (courtesy of Ron Plante). although the ramp at the south end appeared to have been removed. which typically means that it was no longer an operating airport by that time. Ironically, the planned hotel which was intended to take the place of the Kaanapali Airport not built for over another decade. but no airport buildings appeared to remain standing. 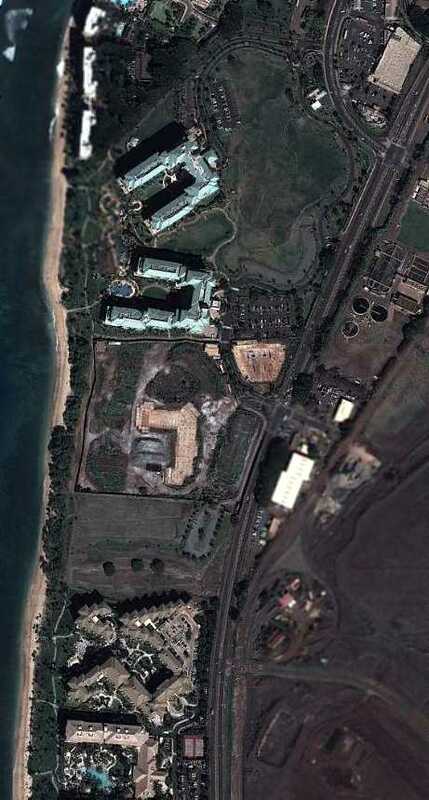 A 2007 aerial photo showed that hotel construction had removed any trace of the former Kaanapali Airport at some point between 2000-2007. 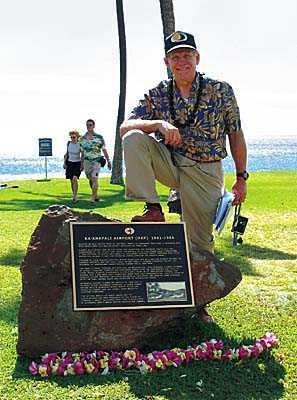 A 2010 photo of pilot Robert Morrison in front of a plaque commemorating Ka'anapali Airport. 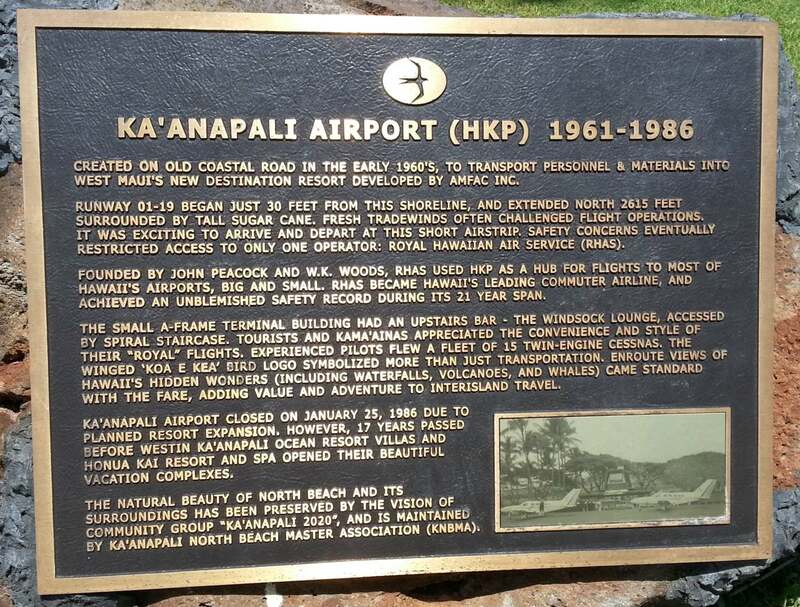 A pre-2017 photo of the plaque commemorating Ka'anapali Airport (courtesy of Kevin Walsh). 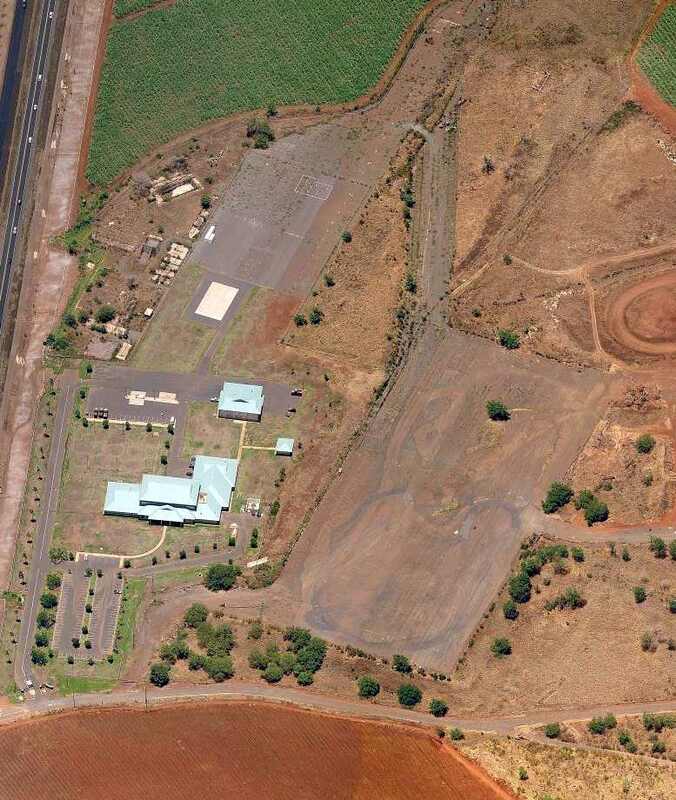 A 2/8/11 aerial view showed hotels covering the site of Kaanapali Airport. 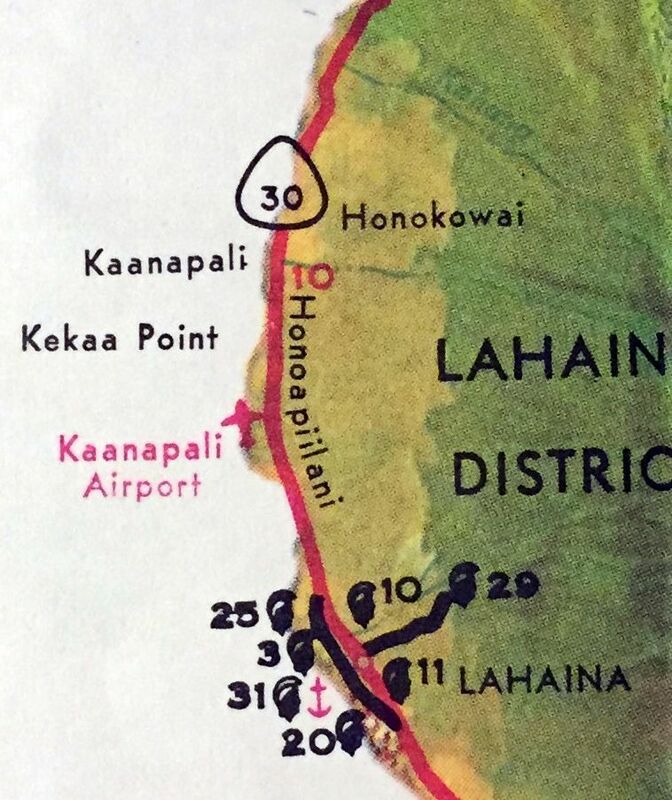 The site of Kaanapali Airport is located southwest of the intersection of Route 30 & Honoapillani Road. Thanks to David Lien for pointing out this airfield. A 1/30/42 aerial view depicted over a dozen aircraft on NAS Maui's ramp. 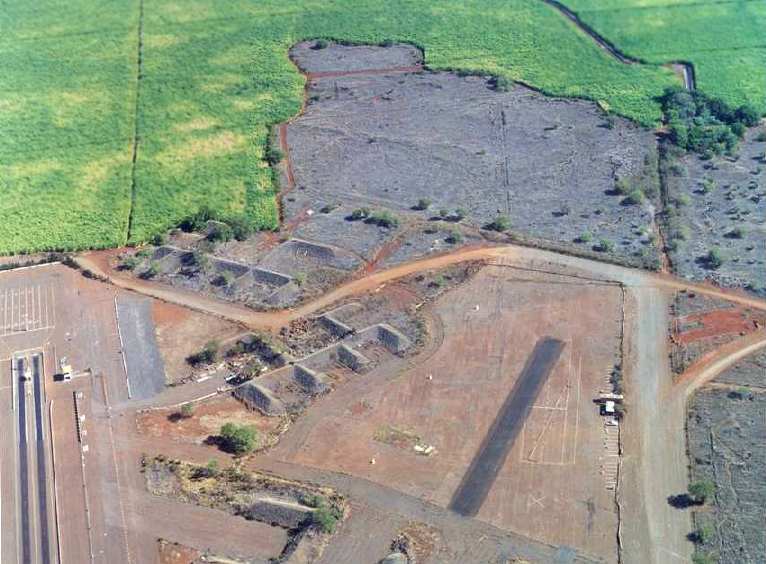 to replace a smaller airfield at Maalaea. Inter-Island Airways began service from the Puunene Airport in 1939. When elements of Utility Squadron VJ-3 arrived to tow targets & operate target drones for the fleet. The Army Air Corps also established a small support base at the airfield in the same year. The base was commissioned as Naval Air Station Maui in 1942. The Navy's facilities at the field were expanded, to support CASU 4 & VF-72. 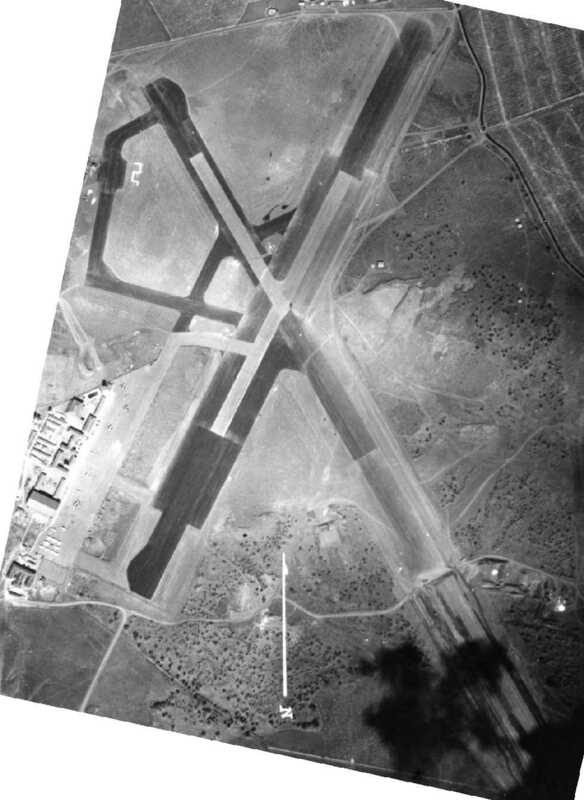 The earliest depiction which has been located of NAS Maui was a 1/30/42 aerial view. 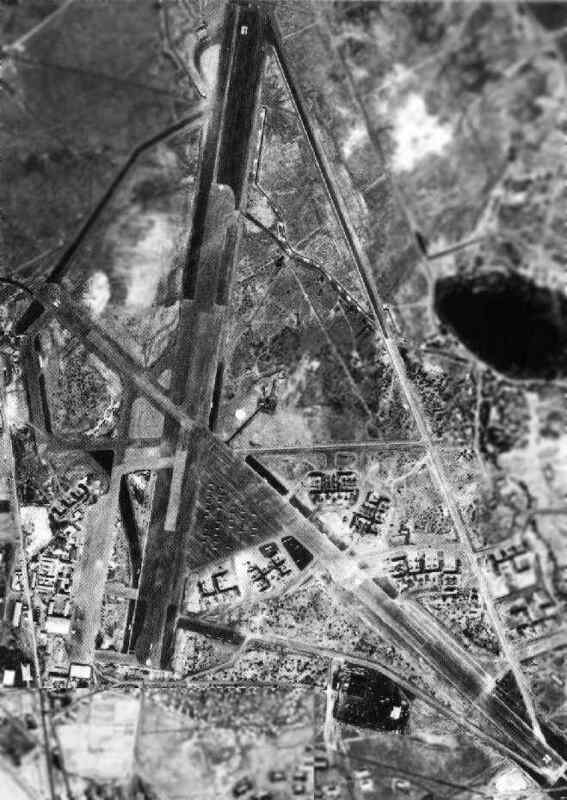 It d depicted the field as having 2 paved runways, with the southeastern end of Runway 14/32 possibly still under construction. Over a dozen aircraft were visible on the southwestern ramp. leaving the Navy as the primary user of the field. An expansion lengthened & widened the runways, and added Link trainers. was opened five miles to the northeast in 1943. 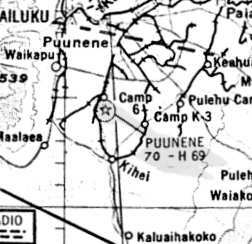 By the end of the war, Puunene had a total complement of over 3,300 personnel & 271 aircraft. A total of 106 squadrons & carrier air groups passed through during WW2. 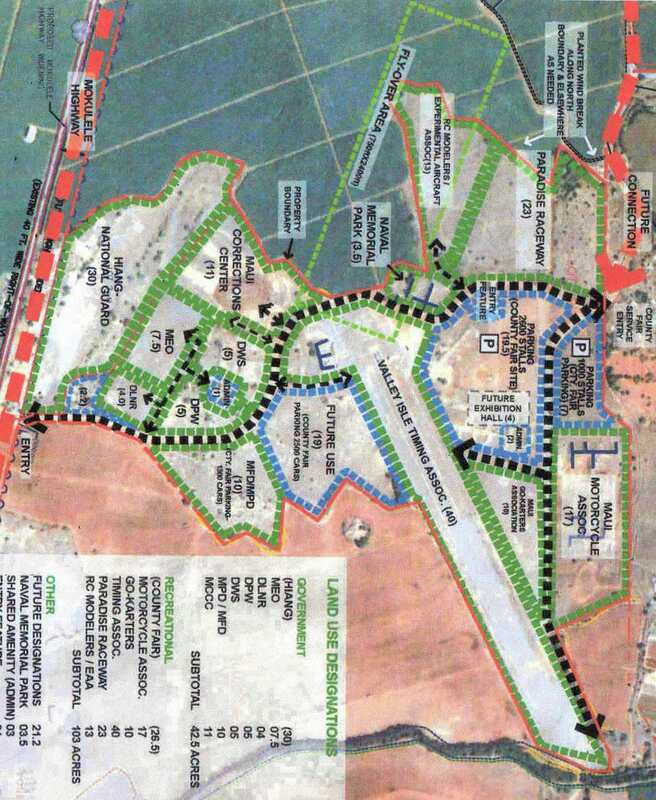 The base consisted of a total of 2,202 acres. with 2 paved runways (14/32: 6,800' long & 1/19: 6,500' long), taxiways, ramps, hangars & other buildings. depicted Puunene NAS as having a control tower. as an Outlying Landing Field for the use of Puunene. 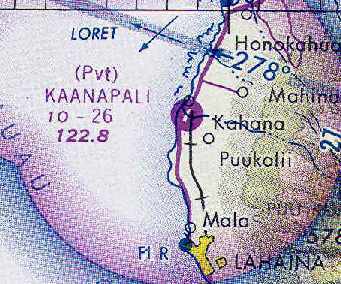 The island of Kahoolawe was also used as a bombing range. NAS Puunene was placed in caretaker status in 1945.
and was reused as Maui's civil airport. as having a 6,900' hard-surface runway. 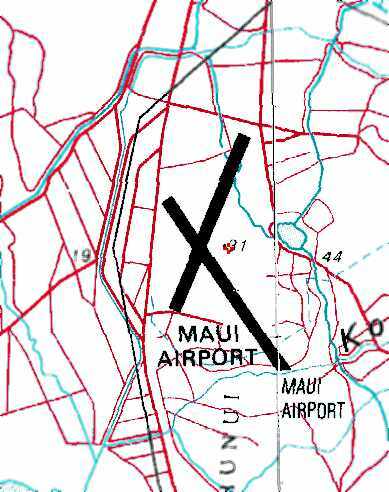 The airfield atPuunene was labeled as Maui Airport on the 1951 USGS topo map. In 1952 the larger former NAS Kahului to the north was closed by the military & became available for civil use. that was apparently not the case. showed that the former Puunene Airport was depicted as "Maui" Airport. with the longest being the 6,900' Runway 14/32. 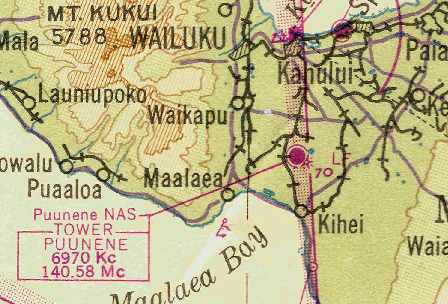 The 1956 USGS topo map depicted the extensive airfield layout of “Maui Airport (Puunene Airport)”. as it was no longer depicted on the November 1960 Hawaiian Islands Sectional Chart. 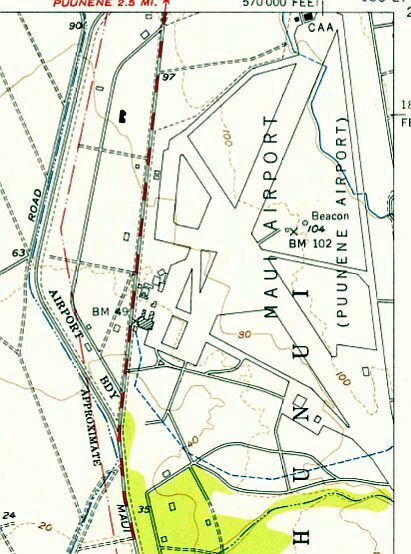 The 1961 USGS topo map depicted "Maui Airport” as having 2 paved runways. 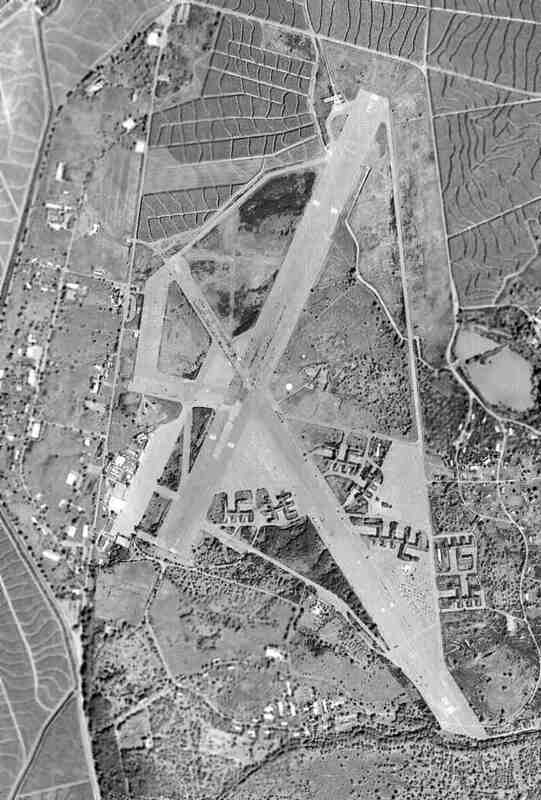 The last photo which has been located showing Maui Airport intact was a 1/4/65 aerial view (from the University of HI). It showed the field to have 2 paved runways & 2 paved ramps on the west side. 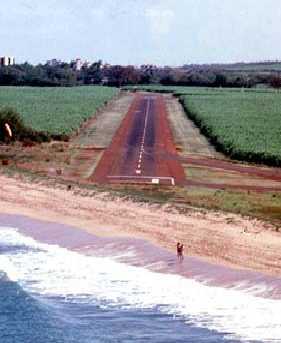 After the Puunene / Maui Airport was closed, Maui racers began using the old runways for impromptu races. cleaning cropdusters to pay for my flying lessons. My dad was a mechanic on the Emair MA-1B duster plane & I assisted him, in addition to cleaning the beast. Our airstrip was actually the old tie-down area, with the drag strip located east of our location. I landed there a couple of times in Cessnas. What we used as an airport was less than 2,000', but more than adequate for the aircraft flown there." A 1977 aerial view showed that most of Puunene's Runway 1/19 & the northwestern ramp had been removed with the land returned to cultivation. Most of Runway 14/32 & the southwestern ramp remained. 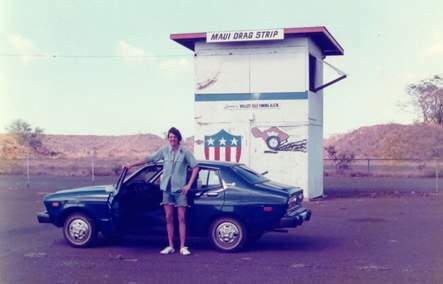 A circa 1977-78 photo of what was then known as the "Maui Drag Strip" (courtesy of Scott). In 2003, Scott recalled "I learned to drive there, as much of the area was still pretty usable 20 years ago. My dad knew about that place, so when we'd go on vacation, we'd head over there for some driving lessons. Ahhhh... nothing like teaching kids how to drive using a rental car & an abandoned airfield. The drag strip part of the runway was still in great shape, as it was still being used at the time for racing. The Christmas Tree was still there. I think there was also a short tower structure built for the drag strip. It was some 2-level box about 10' square, and perhaps 15' tall. I believe that the drag strip was a full 1/4 mile, plus some. The rental car did not turn in impressive times. There was also a go-cart track near the runway. It was just a large area with the track painted down, also in pretty decent shape. the dirt-covered storage rooms shaped as a U, and just driving around & around. 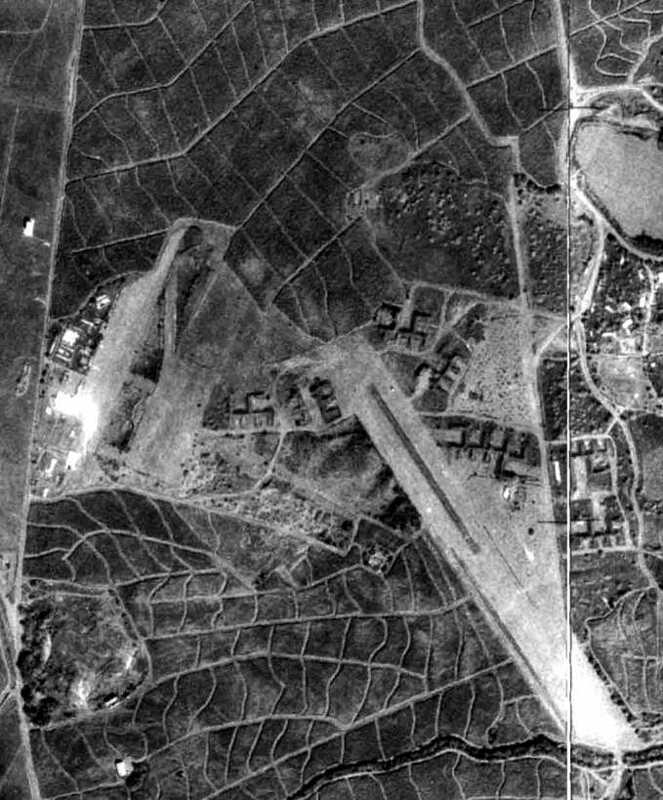 Looking at your old aerial photo, it looks like just the south end of the airbase was what was left when we went there." 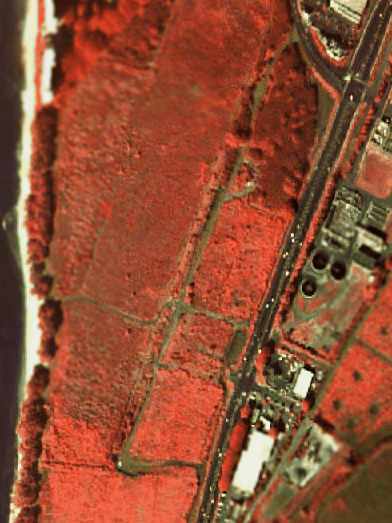 On the 1996 USGS topo map, the majority of the airfield is no longer depicted. 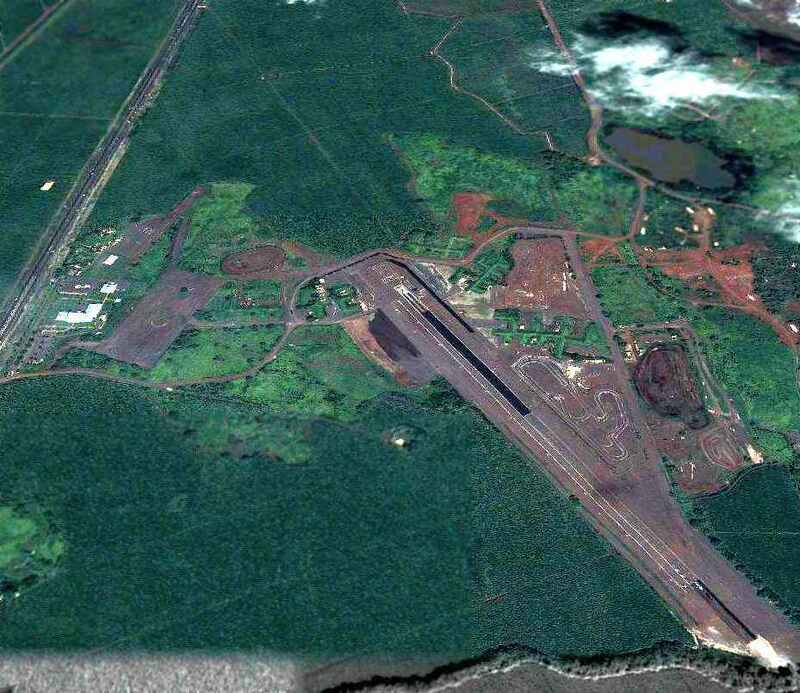 Only a 1,600' portion of the southern end of Runway 32 is still depicted, labeled "Maui Drag Strip". 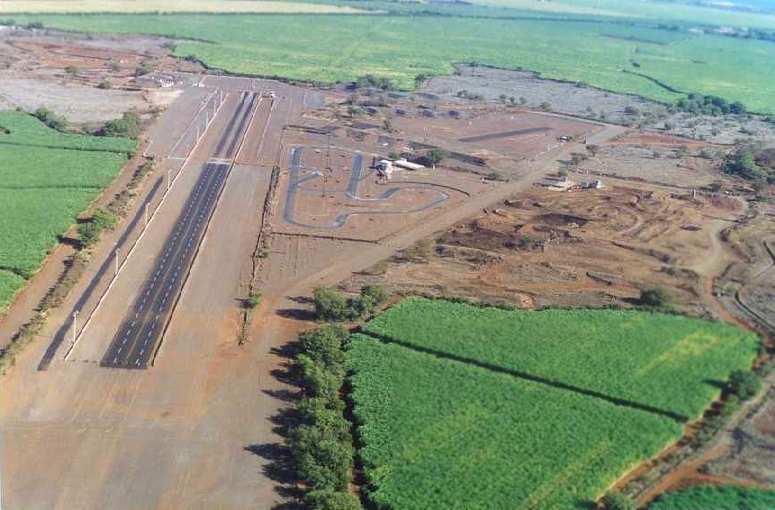 A 2002 aerial view of the Maui Raceway Park Drag Strip (courtesy of Sarah Gee). 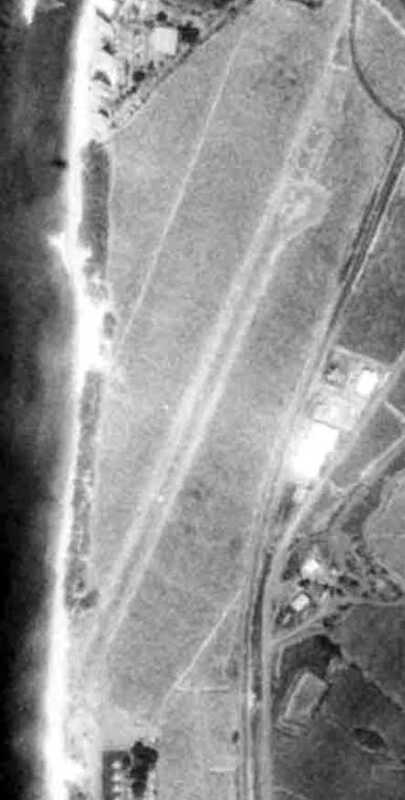 A 2002 aerial view of numerous revetments which remain from the Naval Air Station (courtesy of Sarah Gee). The Radio Controlled landing strip is to the right of the revetments, and the drag strip starting area is to the left. The gray areas at the top are overgrown cement areas remaining from the airfield. and management is provided by the County Parks & Recreation Department. the Paradise Speedway Dirt Track (Stock Cars), and the Maui Remote Control Airplane Club. in addition to groups such as Maui Economic Opportunity & the National Guard. to re-pave the shutdown portion of the track. has been taken over by the National Guard. They've built buildings on the strip so all that's left of the place is the drag strip." John Sullivan reported, "Im February 2004 my wife Vickie & I drove to the site. and we encountered a large helicopter landing nearby. I was later told that there is a helipad there used by a company that supplies & ferries workers to the island of Kahoolawe. removing old ordnance, plane parts, and even human remains." Jim continued, "The red dirt road into the site is not impressive or well maintained. We drove to the drag strip & saw the other facilities, as well as a motocross track. The old earth bunkers are grown over with vegetation, not too inviting for exploration. Trash & old tires litter the site, which is now bordered by sugar cane fields. or the 106 squadrons & carrier air groups that passed through there during WW2. A 9/19/02 Mauai County Master Plan for the NAS Puunene site (courtesy of Jack Sullivan). and spoke with Brian Miskae, Administrator, Long Range Division, Department of Planning. and then sold to H C & S (Hawaiian Commercial & Sugar Company), with the exception of 222 acres. He said that just about 2 months ago the 222 acres were finally deeded to the County. prepared by R T Tanaka Engineers, Inc. & Chris Hart & Partners, Inc.
at about the one-third point of old Runway 32. According to Mr. Miskae, the memorial would include restoration of 2 of the old revetments for exhibits. He didn’t indicate any timetable or whether any funding was available for these improvements or the memorial." as of 2011 they are “working on an update of the master plan for the area that includes the old NAS. A 3/10/11 aerial view looking north showed the remains of Puunene's 14/32 & the southwestern ramp. as the former Navy ramp on the southwest side has painted heliport markings. A circa 2011 aerial view looking north showed the remains of Puunene's southwestern ramp, including several heliport markings. 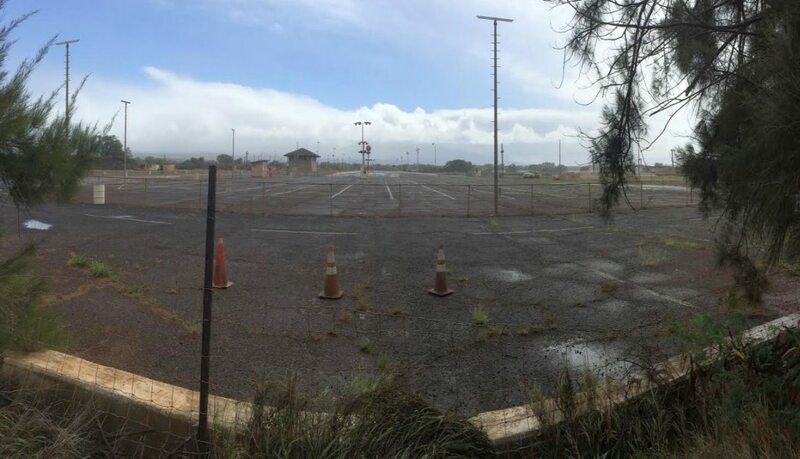 A November 2014 photo by Timothy Williamson looking along the dragstrip located on the site of NAS Puunene. Edward Einhart reported, “In November 2014 I visited NAS 30 in Puunene that my Dad, Joseph Einhart, served at during WWII. It was an AWE INSPIRING feeling to stand on & explore what is remaining of the airfield. I even went into the concrete bunkers built into the earthen bunkers used to protect the planes from bombing shrapnel. The Puunene airfield site sits on the east side of Route 311, three miles south of Puunene.